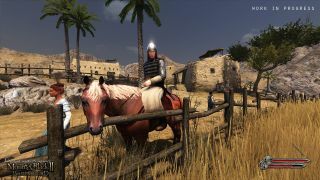 Mount & Blade 2 was first announced with a totally uninformative teaser almost three years ago, but now we're getting some proper details on what new features Talewords has developed for this sequel. Everything's marked "work in progress", but the video is worth a watch for the different weather and seasons in particular, or to see if you can figure out the rules of the board game they show 30 seconds in. More relevant to this kind of freeform medieval RPG are the siege weapons, which look far too big for people to be moving around like that, and the crafting system. The video ends with a look at a replay system that lets you produce short films of sword fights with dramatic swooshy camera movement. We can't wait to see more sword-on-shield action, but this is a very promising first look.